Although I have forever loved inari sushi in it’s simplest form, I always look for delicious ideas to spruce up my old favorite. Several weeks ago, I was at Whole Foods and I needed something quick for lunch, so I stopped by the sushi section. (Yes, I eat store bought sushi. It’s not all bad.) I bought a tray of inari sushi which had shrimp and spicy mayonnaise on top. Of course I was a little skeptical, but my skepticism was unfounded. The sushi was amazing. Then and there, I vowed to replicate the sushi for Sushi Day. This combination is far too delicious to keep to myself. It is a simple, easy recipe that almost anyone will love. (yesterday I made a double batch in less than an hour, including the cooking time for the rice.) The spiciness of the sauce can be adjusted to suit your tastes, and the shrimp can be omitted for vegetarians. 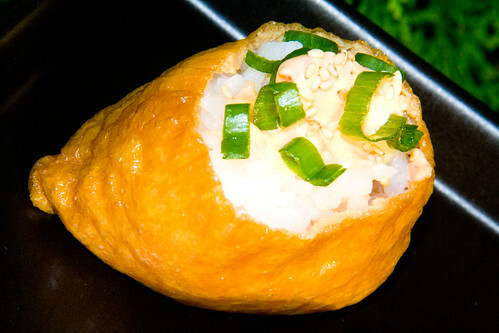 This inari sushi is guaranteed to be a crowd pleaser. Push a shrimp into the middle of each stuffed inari. Scoop a little spicy mayonnaise over the shrimp. Sprinkle chopped green onion and sesame seeds over the sauce. One question – how do I make sriracha sauce? 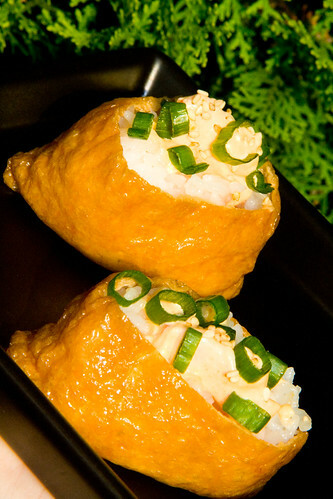 Yvo – Inari is great with all sorts of stuffings… I’ll bet that’s yummy too! Melissa – Sriracha sauce is an Asian hot sauce. It’s usually in a bottle that looks like this. Asian supermarkets usually have it, and sometimes even regular chain supermarkets like Ralphs or Albertsons will stock it. I’ve had the shrimp inari at Whole Foods and was pleasantly surprised as well! For some reason, making inari intimidates me, but I know it’d be a lot cheaper to make this treat at home! Very nice, may I recommend real mayo and not miracle whip in case the thought crossed anyone’s mind. 😀 There’s something that’s just not right when you use the miracle whip. Dave – I agree completely, Miracle Whip just seems… wrong. I want to know how to use panko breadcrumbs on sushi. Does it have to be cooked? If so, should it be cooked first then sprinkled on the roll? When using panko, most often the roll (or chicken breast, or whatever you’re cooking) is coated or topped with the panko crumbs, then deep fried or baked, depending on the application. For sushi, you would coat the roll with the panko breadcrumbs, then deep fry it in oil.